6 Best 6 Person Tents for Camping Reviews 2019 | Are Coleman and Suisse #1? Camping in a group is a fun experience when you have all of the right equipment to make sure that everyone has what they need to be comfortable. One of the things people need when camping in a group is a little space and a little privacy. 6 person tents have extra space for people, as well as their clothing and camping gear gives everyone a space to claim as their own. Interior pockets for storing personal items are a nice feature for camping with multiple people. Lots of mesh windows keep the living space aired out and odor-free, which also helps people feel good about their sleeping area. This post will outline the best 6 person tent reviews as of 2019. The larger your group is, the harder it can become to find suitable sleeping arrangements where everyone has their own private space, but they still feel connected to one another. Cabins or lodges can be viable options for larger groups, but it’s not always possible to get space enough to get everyone into one room. If you reserve multiple rooms, they may not be very close together, which makes connecting a little more challenging. If the goal is to experience the outdoors together, there may be limited outside space for meals and other gatherings. There are a variety of 6 person tents that offer ample space for groups of up to six people. These tents are designed with larger families and mid-sized groups in mind. Good 6 person tents will have ample floor space and a reasonable height. The tents are very easy to set up and take down, despite the large size. Larger tents have the capability to section off spaces for privacy. If you need larger ones check out these 8 people tents:​ https://www.tent.net/best-8-person-tent/ that have more capacity. If those still aren't big enough take a look at this article, that has our favorite 10 person tent recommendations. This Coleman 6 person tent has specially designed windows that are angled to keep out rain, even when they are open. It has an access port so that you can bring an electrical cord inside the tent and an awning over the door to keep out the sun. It’s a fabulous tent for large families, scouts, and longer camping trips. Coleman, an industry leader in camping equipment, makes this 6 Person tent with a spacious interior. It actually has room for two queen-sized beds. Most people stand up easily in this cabin tent with a 6’ 2” tall center height. The poles are pre-assembled for a quick and easy set-up. The guy-lines are illuminated so you don’t trip over them at night time. This is another Coleman tent that they designed with larger groups in mind. It has two rooms that sleep up to six campers comfortably. It has a 17” x 9” footprint and a tall, 6”10” center height. The screen porch is floor-less, so it provides extra ventilation when it’s hot. It’s a great space for dining while protecting your food from bees and insects. Six people can sleep comfortably in this dome tent that has the capability to separate into two rooms. It is made of Weather Armor polyester fabric with a polyurethane coating for water resistant protection. It has three closeable mesh windows and a mesh roof for airy ventilation. It also has a handy gear loft, as well as an E-port for your electrical cords. This is a sporty tent in tan and copper. It’s a cabin-style tent with a 6-pole construction. It has a footprint of 10’ x 10’ and is an astounding 7’ in center height. It’s a free-standing tent with a large, D-style door with a half window in the door. There are also two more windows on the sides. The full mesh roof circulates air and reduces condensation. You get two rooms for the price of one with this 6 person tent by Suisse Sport. It has a removable divider to divide the room in half for privacy. Take the divider down to open up the space to 12’ x 6’ with a center height of 6’. It has 3 mesh windows that zip shut and a mesh ceiling for easy ventilation. Camping with groups of six people don’t have to be cramped or uncomfortable. Large camping tents that have room dividers allow you to open up the space during the day and divide spaces for privacy at night. Ventilation is important when you have multiple people cohabitating in a small space. 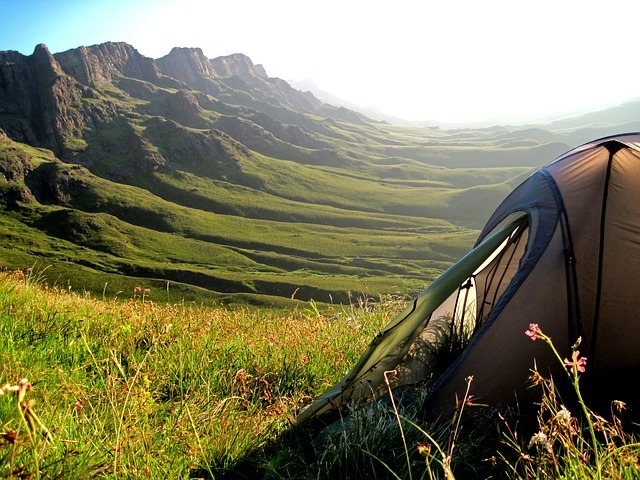 Camping tents that have large doors, large windows, and meshed ceilings will keep tents fresh and aired out. Whether you are a die-hard camper or a pampered glamper, there’s a 6 person tent that is just right for you.